Cicero brilliantly addresses the aspects of old age and its sociological problems in a manner that is as relevant today as it was two thousand years ago. With Latin text, notes, and vocabulary, this is a valuable text that intermediate students will find instructive and insightful. On Old Age was the first ancient text in translation that publisher Benjamin Franklin chose for release in America. He was rightfully proud of his now much admired 1743 edition and anticipated, with his customary wry wit, that reading it would give pleasure: ‘I have, Gentle Reader, as thou seest, printed this Piece of Cicero’s in a large and fair Character, that those who begin to think on the Subject of OLD AGE, (which seldom happens till their Sight is somewhat impair’d by its Approaches) may not, in Reading, by the Pain small Letters give the Eyes, feel the Pleasure of the Mind in the least allayed.’ Franklin was not alone among American patriots in his praise of Cicero, about whom John Adams remarked: 'All ages of the world have not produced a greater statesman and philosopher combined.' Cicero’s On Old Age speaks as directly to all of us today — those approaching old age as well as the younger — as it did to Franklin and Adams. Long considered one of Cicero’s most engaging, charming, and readable treatises, it quite simply transcends time. Cicero steps out of the persona of the “great man” and examines, with superlative clarity, the challenges all human beings must one day face. The relevance of Cicero’s On Old Age transcends time and a multiplicity of cultures. This masterpiece of antiquity examines, with superlative clarity, the challenging problems we must all face, individually, and as members of any society. The paradox is obvious: we hope for old age simply because the alternative — premature death — is unacceptable to our species. Simultaneously, we dread old age because we believe, correctly or not, that it represents the threshold of extinction as well as a state of deprivation and debility - physical, mental, and sexual. Cicero addresses this oppressive ambivalence as it applies to us as individual entities. On Old Age also speaks lucidly of the emotional contradictions inherent to the aspects of approaching old age and the sociological problems induced by this phenomenon. In our own society, its adverse aspects are manifested in controversial and contradictory laws: early retirement, for example, mandated for many resourceful and capable individuals, is diametrically opposed by the common-sense practice of encouraging our elders to assume and retain the highest positions in our society. At the same time, it is obvious that early retirement-enforced results in a reduction of productivity and a decrease in gross national product. As the working class is depleted by the increasing number of retirees, the burden of vastly expanded Social Security funding must be borne by fewer and fewer producers. And finally, while we all hope to attain old age with its attendant comforts, we tolerate inhuman conditions in seniorcitizen nursing homes ... which lie in the future for many thousands of us. So, Cicero’s On Old Age speaks directly to our times. Tolle, lege, therefore, with your students. Classicists who would choose to hide the light of this masterpiece under a bushel are taking an impassable route. 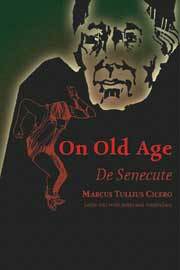 Your students will find Cicero’s On Old Age totally compatible with the humanistic views of contemporary society. Too, they will find this ancient masterwork relatively easy to read in the original-and completely charming. This reprinted edition contains the Latin text and notes edited by Charles E. Bennett, first published as part of New Cicero in 1922. This reprint contains also vocabulary and a list of proper names. Bennett’s edition was chosen for this reprint because it was unanimously recommended by a number of classicists who were polled.